Barking Rabbits: Giant bird-like dinosaur discovered in China. The evolution of bird-like features had long been thought to be accompanied by a decrease in size, meaning the smaller the species, the more bird-like it is likely to be and vice versa. The new discovery shows that isn't necessarily true. Gigantoraptor had long arms, bird-like legs, a toothless jaw, and probably a beak. There are no clear signs as to whether it was feathered. However, judging from its close affinity to other dinosaurs known to have been feathered, Xing Xu of the Institute of Vertebrate Paleontology and Paleoanthropology in Beijing speculates that it was. “This is a dinosaur group we've known about for a hundred years. They are usually the size of a turkey or maybe an emu," says David Unwin, a dinosaur expert at the University of Leicester, UK. "No one would have predicted this. If they had, they'd be laughed at." Now, discovery of something like this always throws our current theories for a loop. As the article in Nature notes, this discovery is such a surprise due to the fact that people in the business of trying to determine the evolutionary path of bird-like dinosaurs never expected anything of this size. For a bird-like dinosaur, this one is gigantic. And because researchers think that this one was a young adult and not fully grown, the adults of this particular species may be even larger. 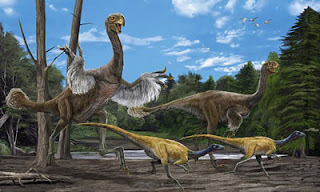 Most theorists in this area had thought that the bird-like dinosaurs were much smaller and continued on downward to get to the final configurations that birds have today. This is what makes science exciting. New discoveries cannot just be ignored or explained away as just some unimportant aberration. Well, a person can try, but since everything is checked, double-checked and triple-checked by your very educated and experienced peers, any attempt at blowing smoke is quickly exposed as just that. Currently held theories, even very well established ones, must be adjusted in order to account for the new data. That is what is meant by evolution being “a theory”. It most certainly does not mean that the new data (like a giant bird dinosaur with a beak) totally invalidates the entire model, which is what many fundamentalist Christians would like you to believe. It does mean, however, that the current theories are in need of adjusting. Sometimes, these adjustments are just tweaks, sometimes they require a major scrapping of all currently held beliefs and essentially starting over. This last category doesn’t happen too often. An Einstein doesn’t come along everyday to displace an Isaac Newton, or Galileo dispose Ptolemy. Usually, the tweaks are more subtle than that. Scientific theories are not some static, dry litany of facts and figures. They are constantly being updated and refined as more and more knowledgeable people contribute to the theory. It is very much a vibrant and energetic process. Sixteen foot tall bird-like dinosaurs with beaks and possibly feathers… Seeing one of those, up close, must have been truly amazing. Right before it ate you, of course.